How much would you pay for a Samsung Galaxy Tab? Before the Samsung Galaxy Tab went on sale, it was always a bit unclear how much it was going to cost. But now that it's on UK shelves, the UK mobile networks are rolling out their data plans along with subsidised retail prices, and the picture is starting to look a bit clearer. The good news is that monthly data plans are available from as low as £5 per month. The bad news is that most plans still involve an upfront fee of about £500. You can also get the Galaxy Tab SIM-free from £499. 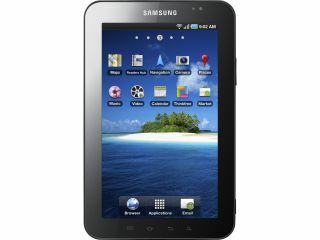 So what are the best Samsung Galaxy Tab deals currently available in the UK? Vodafone is offering the Galaxy Tab for a set upfront fee of £499, providing you also sign up for a data plan. The cheapest Tariff is £3 per month, but on that deal you'll have to pay an additional £2 every day you use 3G data, with a 500MB limit for that day. £25 per month for 5GB. Orange is going for a slightly different strategy, offering a slightly better upfront deal depending on which data plan you choose. The cheapest monthly deal is a pay-as-you-go type deal where you pay 5p per MB with a £40 cap for the month. On this deal you pay £529 for the device upfront. £15 per month for 1GB anytime + 1GB quiet time (+£499, 12 month deal). We're expecting more networks to reveal their 3G data plans for the Galaxy Tab soon, so we'll let you know when we know more.